Tuberculous meningitis (TBM) in young children typically follows milliary dissemination of bacilli to the choroid plexus and then to the cerebrospinal fluid. The inflammatory reaction is concentrated in the basal cisterns. Other important complications are obstructive hydrocephalus and cranial nerve palsies. Deafness (8th cranial nerve) is especially common in survivors. This 2 ½ year old child was admitted to a country hospital following a seizure. She showed the features of stage III tuberculous meningitis and her condition rapidly deteriorated despite initiation of treatment. 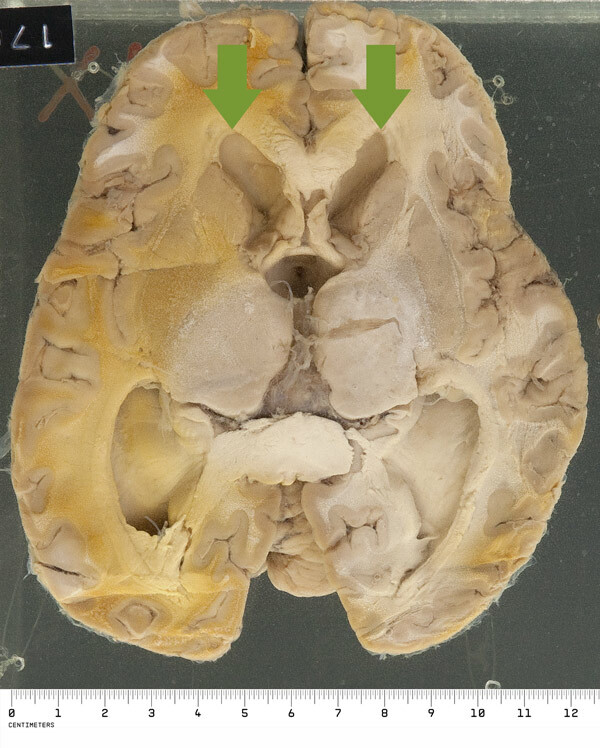 The brain is markedly swollen (with flattened gyri and narrowed sulci). There is a thick, fibrinous exudate limited to the region of the basal cisterns. 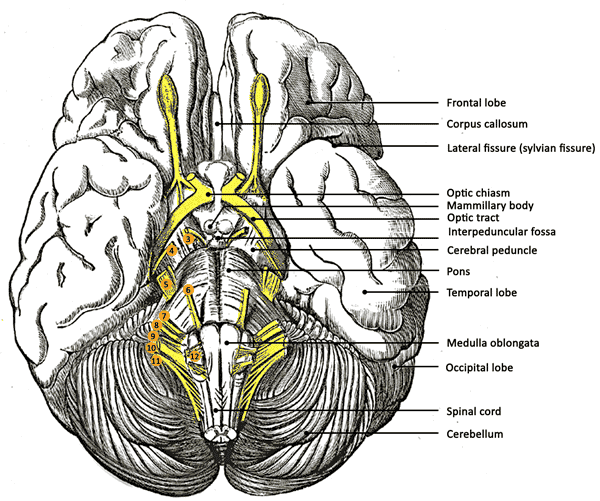 It envelopes the circle of Willis and several cranial nerves, in particular the 1st (optic) and the 3rd. 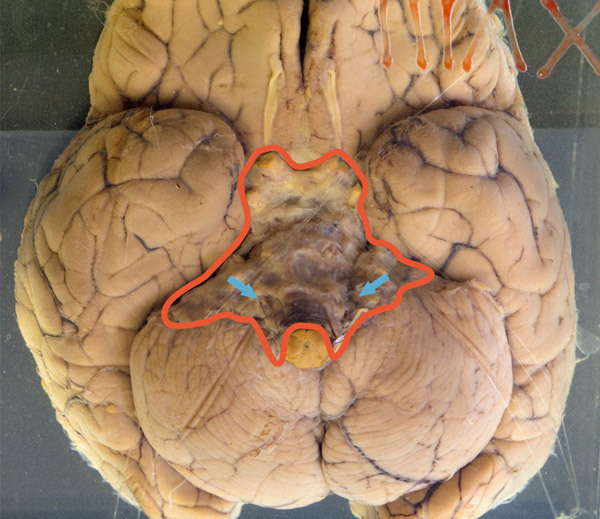 The lateral (or exit) foramina of the 4th ventricle are also obscured. 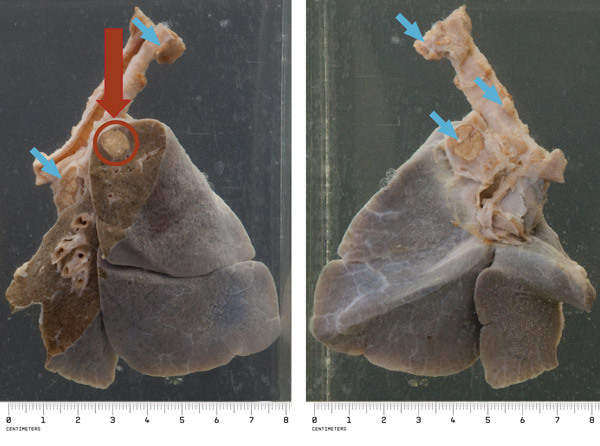 This is the right lung of this child. There is a Ghon focus in the apex of the right lung, and the hilar, peribronchial and peritracheal glands are enlarged and caseous - this is a primary tuberculous complex or Ghon complex.